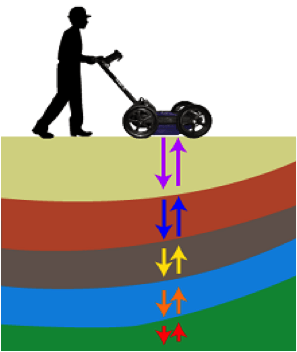 Ground Penetrating Radar, or more commonly known as GPR, is an important technological development that enhances human’s ability to visualize beneath the earth in a nondestructive or labor intensive manor. 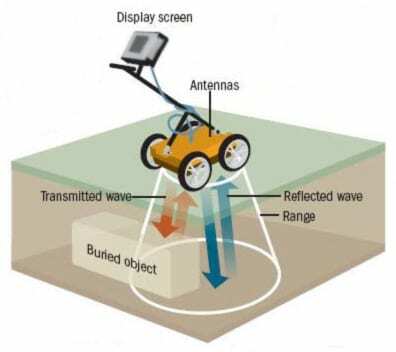 Its purpose is to identify and classify any given target underneath the surface of the earth. GPR greatly eases the tasks and increases safety of the workers in the industries and fields of construction, military defense, archaeology and geology and it is environmentally friendly, as well. Although, currently, on ground penetrating radar devices, the material beneath the earth is not displayed, but rather an estimated value that corresponds to the material. The figure below shows how the GPR is typically set up. Therefore, the primary research question for this project is how can we expand a way for the GPR to estimate the substrata and display the material names based on the estimated values received. The goal is to make the lives of everyday users easier, by displaying the name of the material beneath the ground. The figure below shows how the device gathers the received values when material changes. The project consists of software and hardware aspects. The software portion is simulating the function of ground penetrating radar, as well as, programming the hardware devices. The simulations were developed using the programming language MATLAB. The hardware segment is developing a device for GPR to displaying the material name to enhance today’s mechanism. The device will be created with an Adruino microcontroller and an LCD display.